Dance Commentary by Heather Desaulniers: "Cinderella"
And just like that, San Francisco Ballet’s 2017 repertory season has reached its last leg. A varied and compelling selection of programs have graced the War Memorial Opera stage this year, and the trend continues with the return of Christopher Wheeldon’s whimsical flight, Cinderella©. Just like when the ballet had its US premiere at SFB in 2013, Artistic Director Helgi Tomasson opted to make it the final offering, a perfectly harmonized cadence to conclude a glorious season. 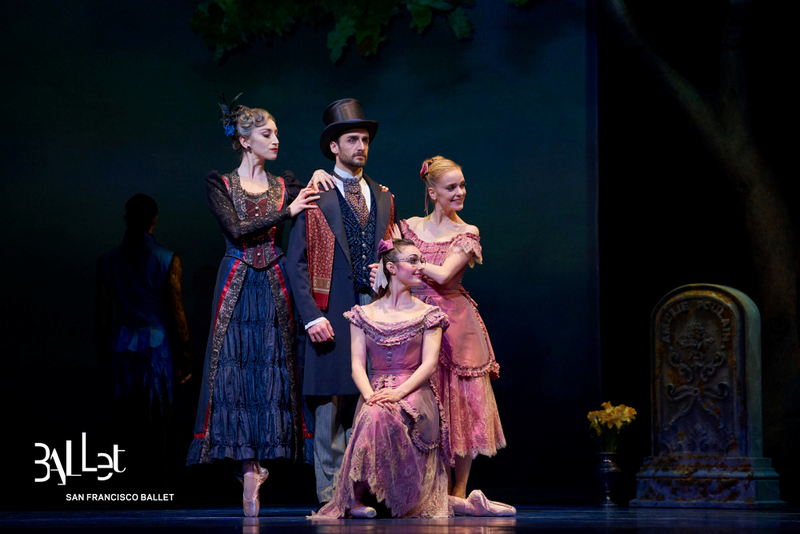 Wheeldon’s Cinderella© is a fairy-tale ballet for the ages, told through a Prologue and three Acts. The Prologue and Act I are all about the narrative, which means that the cast must have both the acting and dancing chops to successfully communicate and interpret the story. Thursday night’s ensemble certainly delivered, aptly conveying a wide range of human emotion - drama, humor, loss, jealousy and hope. In the prologue, we meet the title characters as children, (danced by students from the San Francisco Ballet School). Quickly the cast ages, and we experience the next chapter of their individual journeys – Cinderella’s father remarries; Prince Guillaume is called to responsibility and duty. Fast forward to Cinderella’s home, where her Stepsisters’ vanity and nastiness as well as her Stepmother’s cruelty reign supreme, especially when Cinderella invites a stranger inside to escape the cold, everyone unaware that this person is actually the Prince in disguise. His friend Benjamin, masquerading as the Prince, arrives on the scene and invites the family to the Royal Ball, Cinderella’s Stepsisters and Stepmother doing everything in their power to impress him. Four Fates, who are tasked with watching over Cinderella, frame all of this early storytelling. More than anything else in the ballet (including I think, the central tree structure), it is they who embody the important role of Cinderella’s supernatural guardian. Moments of lovely dancing were peppered throughout. Sarah Van Patten was a luminous and breathtaking Cinderella, enrapturing the audience with technique and theatricality from her very first solo at her mother’s gravesite. Replete with beautifully intricate choreography, buoyant jumps in sixth position transitioned effortlessly into long and longing extensions. Such subtle inflections in Van Patten’s movements and demeanor informed her performance from beginning to end, and gave the titular character a dynamic layeredness. Sasha De Sola and Ellen Rose Hummel as Stepsisters Edwina and Clementine were hilarious in their constant attempts to woo the Prince. And every time, the four Fates were in the mix, one couldn’t help but notice that their choreography was some of the most physically intense – a combination of driving ballet steps, athleticism and martial-arts influences. If Act I is mostly about the narrative, Act II (the ballroom scene) is indeed all about the dancing. From the guests’ grand waltz to the wave that reveals Cinderella’s entrance to the numerous pas de deuxs, Wheeldon’s eclectic mix of classical ballet, contemporary vocabulary, wit and physical theater was a thing of brilliance. Just like how neo-classical dance can reveal nuances in the score, so does Wheeldon’s choreography similarly elevate this classic narrative tale. Cinderella and Prince Guillaume’s (Tiit Helimets) first pas de deux was appropriately gentle and restrained, with both lower extensions and lower lifts. This expanded over the course of the duet to include full and lush movements, a reflection of their growing relationship. Myles Thatcher’s Benjamin was so much fun to watch and his dance with Hummel (a sweet secondary romance plotline in the ballet) was a sheer delight, full of graceful temps de cuisse. Alone in the space after the guests from the ball are ushered outside to look at the stars, Van Patten and Helimets soared through their second pas de deux, each stunning lift surprising with an unconventional, unexpected approach. But perhaps the most significant achievement in this Act is that Wheeldon keeps it moving. Like village scenes, the ballroom setting is fairly typical in story ballets, and they can lag. Not in this Cinderella©. Aside from the corps de ballet having occasional spatial challenges and resulting collisions, it was picture perfect.